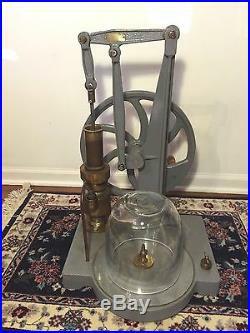 Vintage Vacuum Pump Machine Hand Operated with Glass Globe Central Scientific Company. Would make a great gift or keep for yourself! 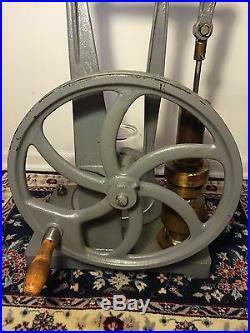 Beautiful older hand operated Vacuum Pump here. The Vacuum Pump was made by Central Scientific Company of Chicago, IL. 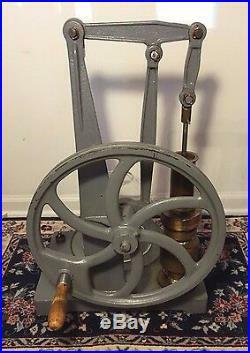 The Pump is made of cast iron painted gray and then the pump is made of brass. The hand wheel operates the pump and air is actually still be sucked out of the brass/copper outlet that sits under the glass globe to create the vacuum. The wood handle on the wheel is in place. There is a spring around the perimeter of the wheel. That may have allow the piece to be hooked up to an electric motor instead of having to hand crank? The glass globe sits down on a thick ring of what appear to be plexiglass, not a piece of glass. All the cast iron pieces painted gray appear to be intact, no cracks or repairs to them. 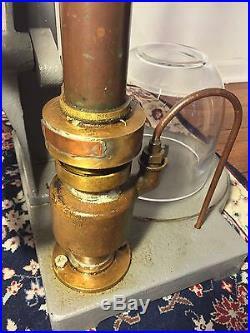 Looks like the brass pump may have been repaired at some point in past, see solder rings and the copper patch in one place. One of the pins in the hinging assembly to drive the pump is not original to the piece. 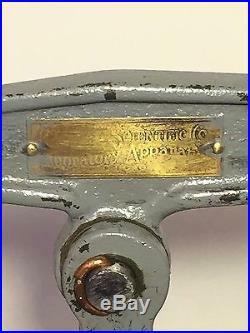 The brass tag that is still on the pump body says, " Central Scientific Company, Laboratory Appartus, Chicago" The "Central" and "Chicago" are hard to read as worn on the label. 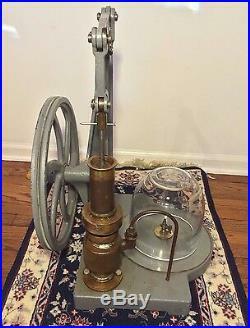 The Vintage Vacuum Pump is 24.5" tall, by 21.25" across by handle, by 16.25 wide. The glass globe is 8" tall by 8" across. So expect to have to do some re-assembly. Sorry, the other things you might see in the pictures are not included. 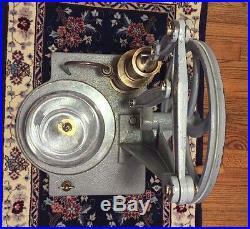 Only the Vtg Vacuum Pump that is described here is for sale. Please carefully review all the attached pictures. Ask all the questions you have, come see in person or send a friend to see the item on your behalf, prior to deciding to acquire it. Please check out our other Timeless Tokens store listings as we are regularly adding new items. We specialize in antique and vintage artwork, books, collectibles, furniture, musical instruments, paper ephemera, marine/nautical, and clocks. Select countries (disclosed in individual item description). All items are as described, with any item history, known defects or imperfections disclosed in each listing. Welcome to Timeless Tokens, our online store, offering antiques, collectibles, and conventional merchandise for every need and occasion. Timeless Token represents the fulfillment of a long-held dream to create a business that allows us pursue our passion for finding unique collectibles and everyday items that can be shared with and appreciated by all. Our listings are updated regularly and focus on items that we know best - vintage artwork, books, clocks, collectibles, furniture, toys/model trains, musical instruments, and decorative boxes. We appreciate your taking the time to visit our store, and hope you will provide us feedback that will enable us to make your shopping experience the best it can be. Referrals are an important part of our business. 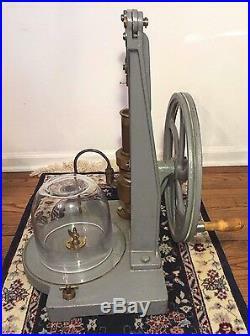 The item "Vtg Vacuum Pump Machine Hand Operated with Glass Globe Central Scientific Comp" is in sale since Sunday, August 19, 2018. This item is in the category "Collectibles\Science & Medicine (1930-Now)\Scientific Instruments\Microscopes, Lab Equipment". The seller is "hallboys321" and is located in Wilmington, Delaware. This item can be shipped to United States, Canada, United Kingdom, Denmark, Romania, Slovakia, Bulgaria, Czech republic, Finland, Hungary, Latvia, Lithuania, Malta, Estonia, Greece, Portugal, Cyprus, Slovenia, China, Sweden, Thailand, Belgium, France, Ireland, Netherlands, Poland, Spain, Italy, Germany, Austria, Bahamas, Israel, Mexico, New Zealand, Switzerland, Norway, Saudi arabia, Ukraine, United arab emirates, Qatar, Kuwait, Bahrain, Croatia, Malaysia, Chile, Colombia, Costa rica, Panama, Trinidad and tobago, Guatemala, Honduras, Jamaica, Barbados, Bangladesh, Bermuda, Brunei darussalam, Bolivia, Egypt, French guiana, Guernsey, Gibraltar, Guadeloupe, Iceland, Jersey, Jordan, Cambodia, Cayman islands, Liechtenstein, Sri lanka, Luxembourg, Monaco, Macao, Martinique, Maldives, Nicaragua, Oman, Pakistan, Paraguay, Reunion, Uruguay, Antigua and barbuda, Aruba, Belize, Dominica, Grenada, Saint kitts and nevis, Saint lucia, Montserrat, Turks and caicos islands.